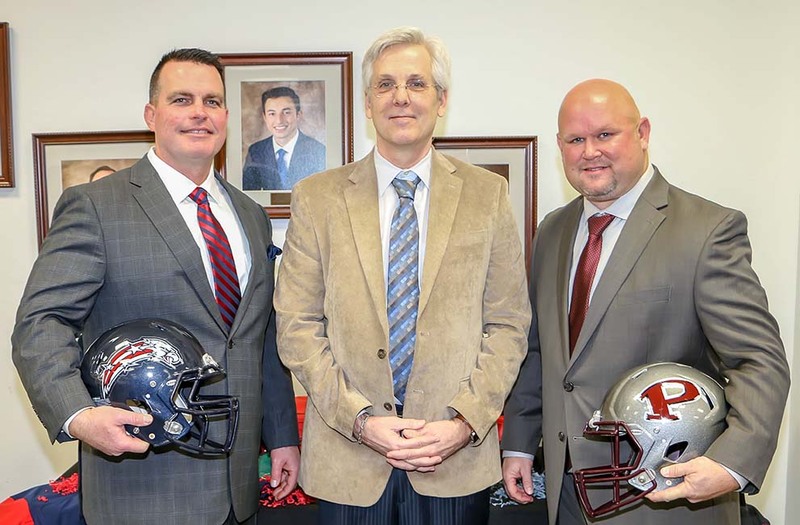 PEARLAND — After much speculation and various information going out...it is now official that Pearland and Dawson have new head football coaches that have been approved by the Pearland ISD school board that was announced this morning. George Ranch Longhorns head coach Rick Tullos will be taking over the reigns for the Oilers. Tullos comes to Pearland after serving as the Longhorns' head coach since 2011 when they opened. In 2013, the Longhorns posted a 13-1 record, advancing to the Class 5A Region III Div. I championship game where they lost to Brenham, 35-6. In 2014, George Ranch made a run to the Region III championship game, this time falling to Temple, 28-14, and finishing the season with a 12-2 mark. Its only other loss that season was a 38-35 loss to Friendswood. In 2015, the Longhorns recorded a perfect 16-0 mark in their state championship run, including a 56-0 spanking of Mansfield Lake Ridge in the title game. George Ranch was elevated from 5A to 6A in 2016 and have been in the same district with the Oilers and Dawson the past two years so Tullos is very familiar with Pearland falling to the Oilers 13-7 that season. They beat Dawson 42-25 in that initial meeting. This past season (2017), George Ranch finished with a 6-4 record in the Hurricane Harvey-shortened campaign. The Longhorns defeated Pearland, 28-21, and lost to Dawson, 14-13, during the regular season. Tullos is a graduate of Sam Houston State University. 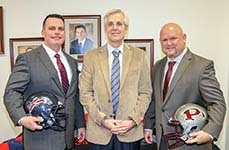 Clear Brook head coach Mike Allison will actually be coming home to Dawson. On the Pearland coaching staff before Dawson opened, Allison moved from the Oilers to go with former Pearland offensive coordinator Eric Wells to open up the new Pearland ISD high school. Wells resigned, for health reasons from Dawson, to become the PISD assistant athletic director with AD Ben Pardo which opened the door for Allison who was at Clear Brook for the past three years. Allison compiled a 15-17 record in his three years as the Brook head coach, reaching the playoffs one time and narrowly missing on the other two occasions. Clear Brook finished fourth in District 24-6A in Allison's second year (2016), but the Wolverines made a deep run in the post-season including a 55-42 win over Dawson in the first round and a 42-18 win over Kingwood. The Wolverines' playoff ride ended in the regional quarterfinals when they lost to Cy Ridge, 49-14. While at Dawson, Allison was the Defensive Coordinator and saw the Eagles make the playoffs each year after the inaugural season that didn't have a senior class. Dawson advanced at least three rounds deep in the playoffs during his time there including two times to the Class 4A Division I state semifinals. Allison has a proven record with Dawson and Eagle Nation should welcome him home with outstretched arms. So -- there you have it -- with more news coming tomorrow regarding the UIL realignment which will let you know what district and teams that Pearland and Dawson will be playing in the next two years. Stay tuned!